Joanne Slavin, PhD, RD, a professor in the Department of Food Science and Nutrition at the University of Minnesota and former member of the Dietary Guidelines Advisory Committee, will do a deep-dive into the Dietary Guidelines for Americans. She’ll discuss the process of how they are developed, the selection of committee members, and what challenges are faced. Dr. Slavin will also discuss how you as nutrition professionals can get involved in the process, so come with questions for the live Q&A. Can’t make the live webinar? Don’t worry – you can access the recording in the siggi's sessions portal on April 3 along with all the other sessions’ webinars available on-demand for CPE credits. If you are new to siggi’s sessions or have already signed up but forgot your password, just sign up to receive a password! 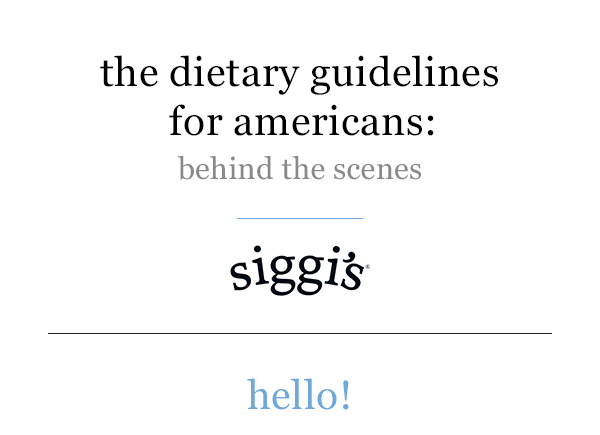 Don’t forget to join our health and wellness ambassador group to stay up-to-date on the happenings here at siggi’s!